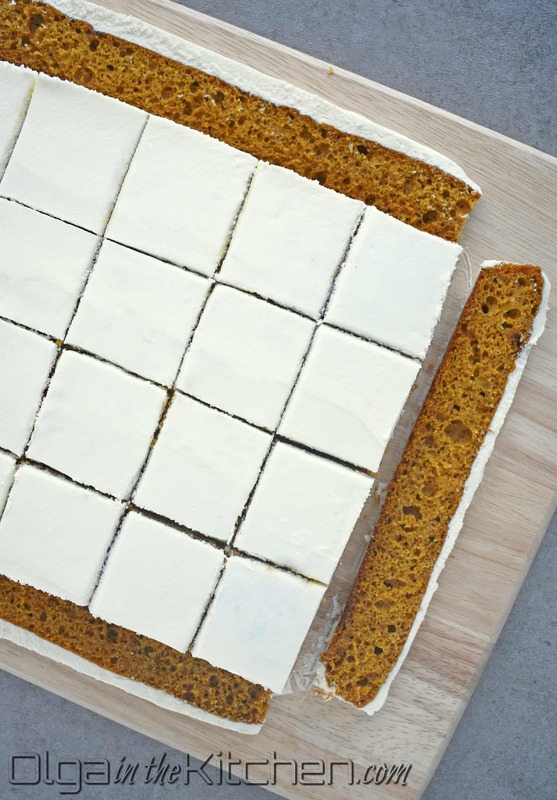 Pumpkin Sheet Cake: easy to make, fluffy, moist; topped with delicious sweet cream cheese frosting. This is the BEST pumpkin dessert you will ever make. 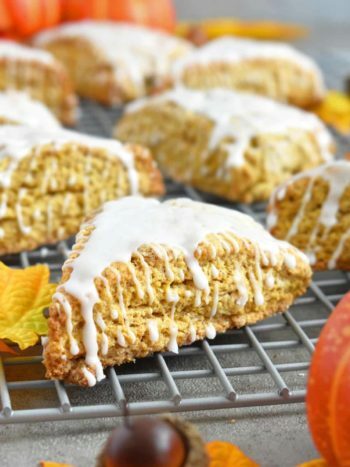 It’s the perfect fall treat! 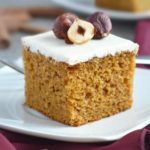 This cake is extremely easy to make and it’s probably the best pumpkin cake I’ve ever had. Once you start at one piece, you won’t be able to stop. 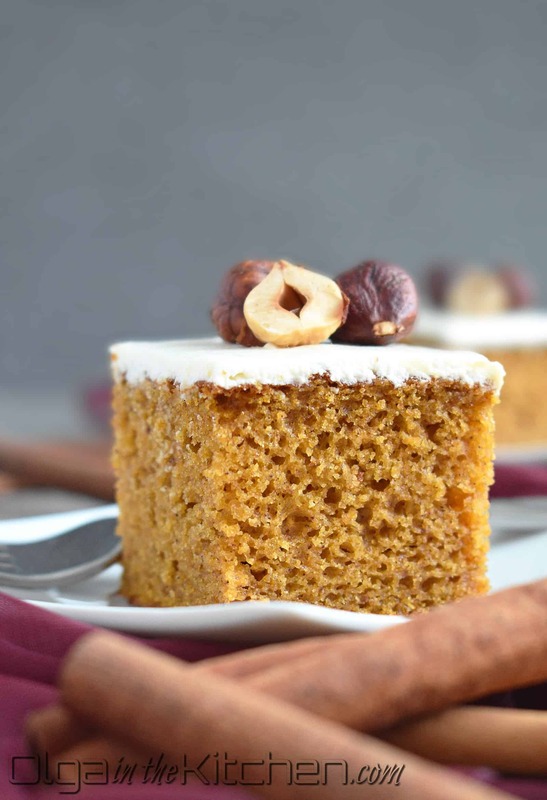 The pumpkin flavor combined with cinnamon, nutmeg, cloves and ginger makes this cake sound so cozy and great fall treat to go with that cup of coffee or tea. This month is all about pumpkin and as it’s ending, you might think we’ll be saying goodbye to pumpkin, but not in my world. I can eat pumpkin anytime of the year; there is no law that it can be eaten only in October 🙂 Any rainy or cold day – whether it’s spring or summer, it reminds me of autumn and pumpkins. First thing I do? 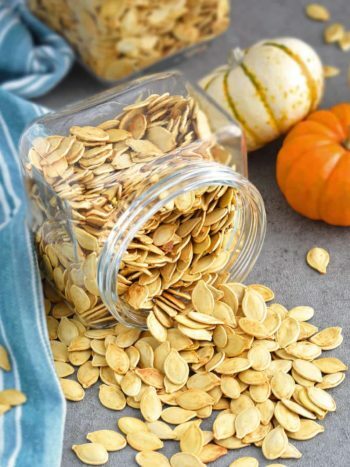 I reach for the canned pumpkin in my pantry. With so many pumpkin recipes floating around the web, it’s hard to choose which one might be the best. I tell you, THIS is the best! 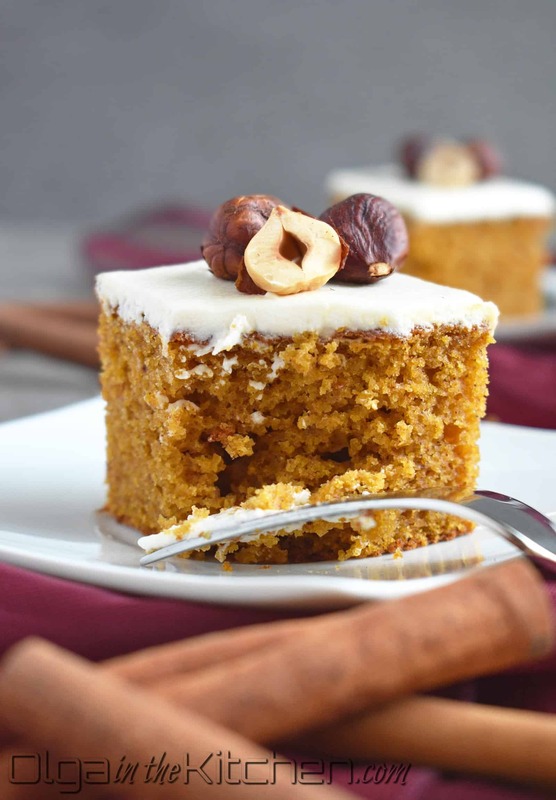 If you want to truly experience fall, forget about other cakes and make this one. 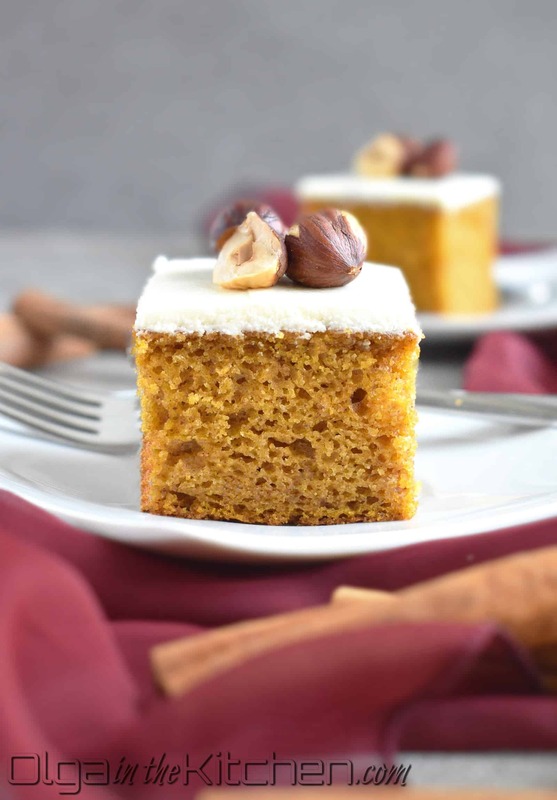 This Pumpkin Cake reminds me a lot of the Babka recipe on my blog in terms of preparation, taste, texture and ease. Babka recipe had been one of the favorites by my viewers since day one it got posted and I have a feeling this cake will also become a favorite. Just like Babka, you’ll cut it into squares, top with hazelnuts for extra beauty and you’ll end up with a delicious treat that can be served as hand food as well. 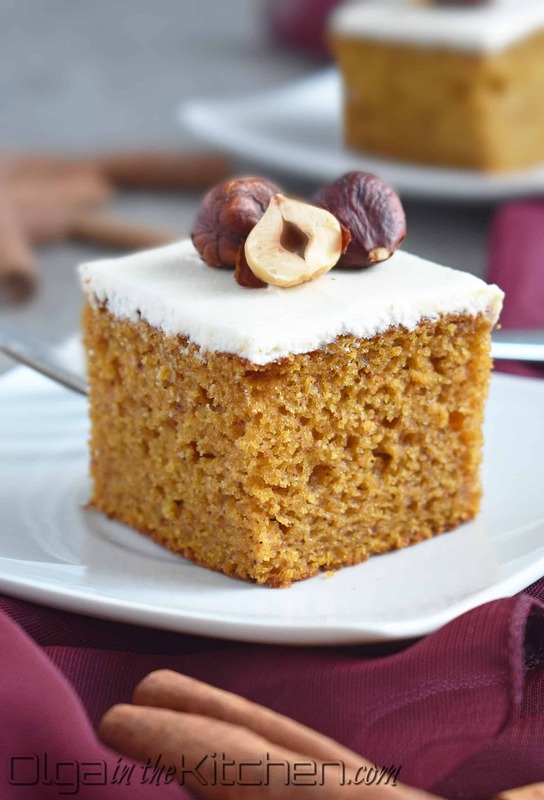 The oil and pumpkin make the cake so moist and beautiful in color. 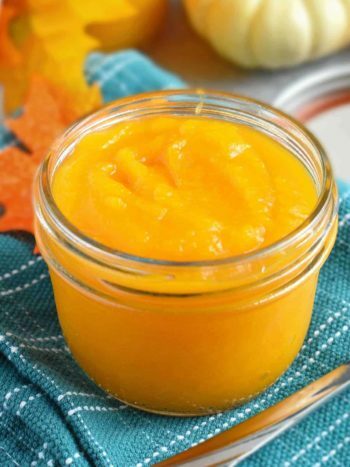 You’ll use an entire standard 15 oz can of pumpkin. That’s another fact I love about this recipe because you won’t have remaining pumpkin sitting in the fridge, waiting to be used. Making this cake so many times, I realized that whisking the ingredients by hand make the cake fluffier compared to as you would beat with mixer; this cake does not like over-mixing! Preheat the oven to a 350°F. Grease and line a 9×13 baking pan with parchment paper and set aside. 1. 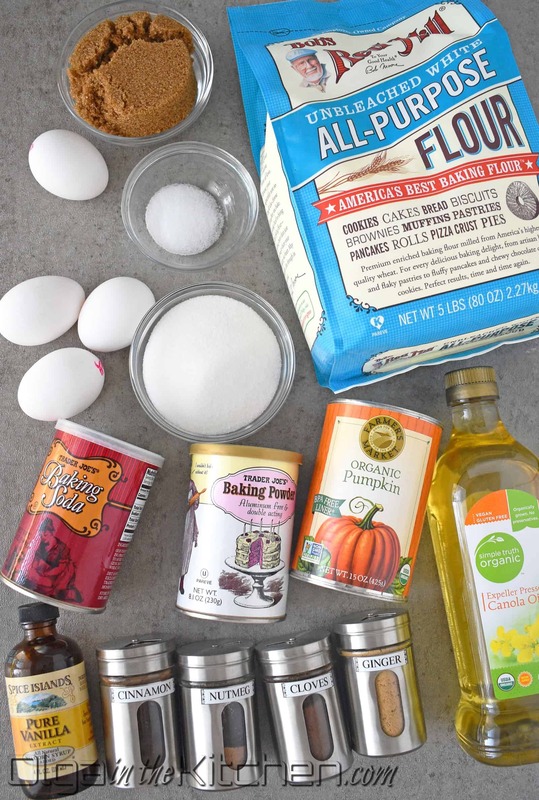 In a medium bowl, combine and whisk: 2 cups all-purpose flour, 2 tsps baking powder, 1 tsp baking soda, 1 tsp fine salt, 1 tsp cinnamon, 1/4 tsp nutmeg, 1/4 tsp cloves and 1/4 tsp ginger. Set aside. 2. In a large bowl, combine 4 eggs and 1/2 cup granulated sugar. Whisk for 30 seconds. 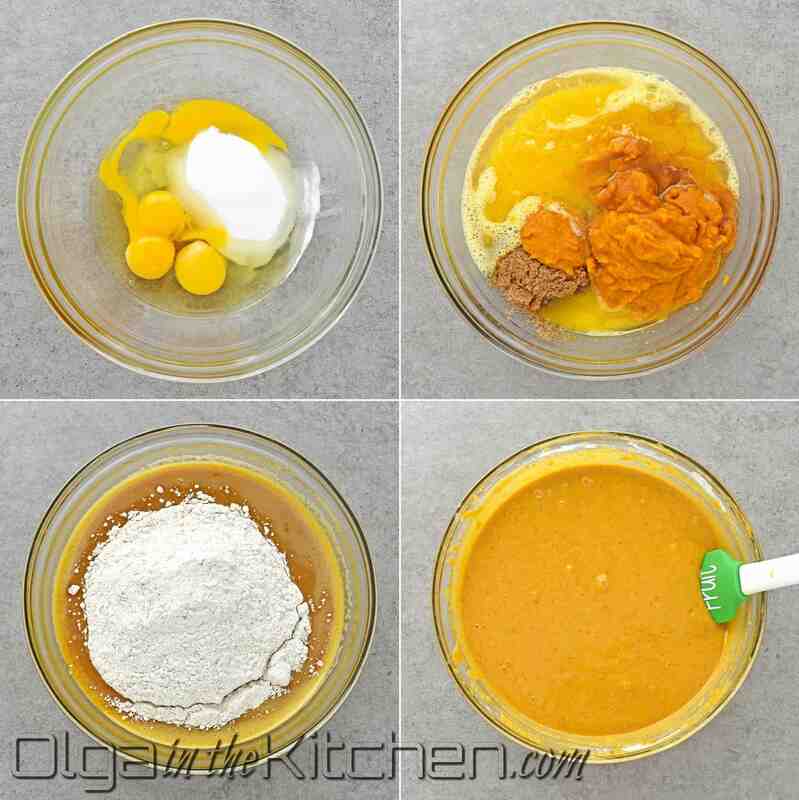 Then add: 3/4 cup brown sugar, 1/2 cup oil, 1 can pumpkin puree and 1 tsp vanilla extract. Give it a good whisk until combined. 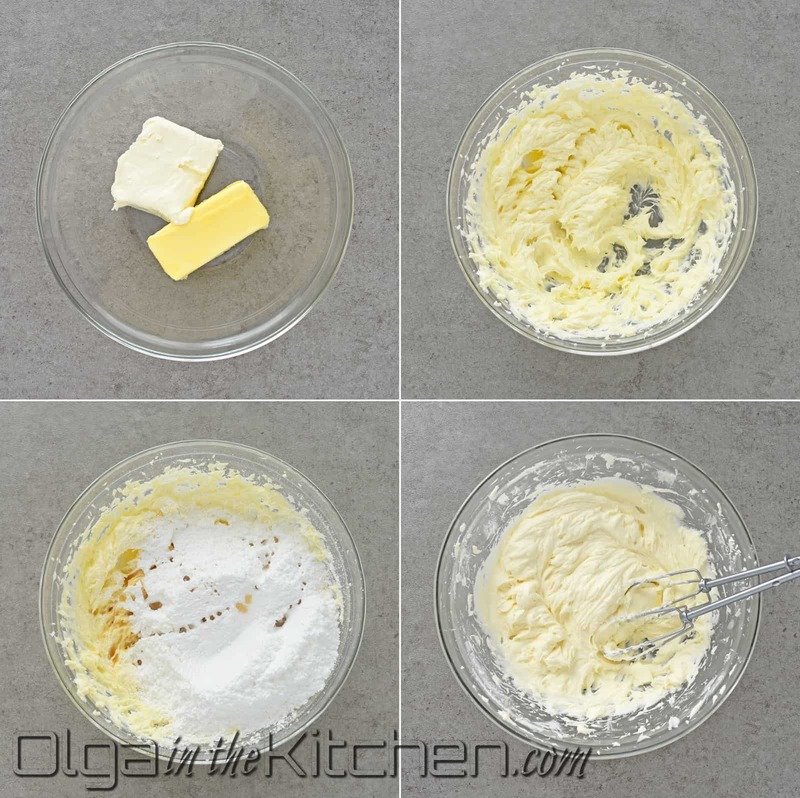 Add the dry ingredients to the batter and whisk until fully combined. Batter will be thick. 3. Pour and spread the batter into the prepared pan. Bake for 27-30 mins until toothpick inserted in the center comes out clean. (I did 28 mins. Baking times may vary. If you find the top or edges of the cake is browning too quickly in the oven, loosely cover with aluminum foil). 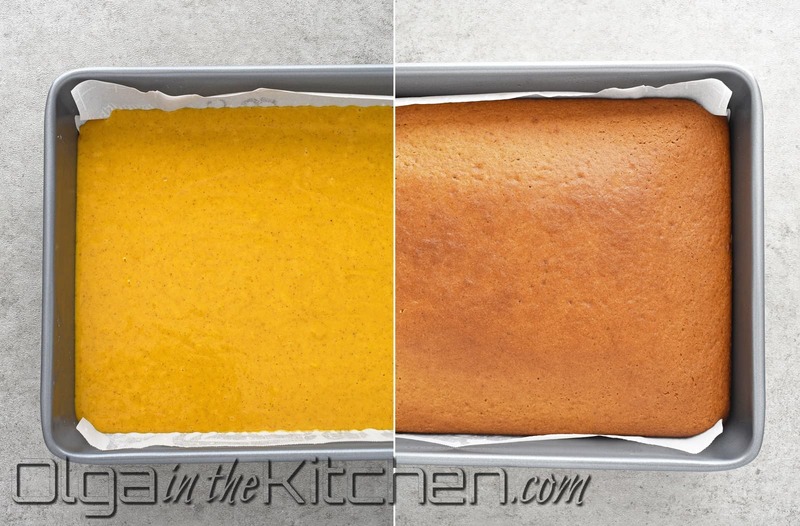 Remove the cake from the oven and let it cool for 10-15 mins, then by grabbing the parchment paper on both sides, slowly transfer the cake to a cooling rack to completely cool. (Gently go over the sides with spatula where there is no parchments paper before picking the cake up to make sure it’s not sticking – sometimes happens). 4. In a medium bowl, combine and beat 1 stick unsalted butter and 4 oz cream cheese on high speed until smooth and creamy. Add 1 cup powdered sugar, 1/2 tsp vanilla extract and 1/8 tsp salt. Beat for about 2 mins until fully combined – start on low so you don’t get covered in powdered sugar and increase the speed to high. Spread the frosting on the cooled cake and refrigerate for 1-2 hrs. This will help the frosting set and make the cutting easier. 5. Cut off cake edges and cut the cake into squares. (When cutting the cake, wipe off the knife with a napkin every once in a while – this will prevent the frosting from getting onto sides and crumbs of the cake on top of frosting). Decorate with hazelnuts or pecans. I prefer hazelnuts here – gives that elegant look to the cake! 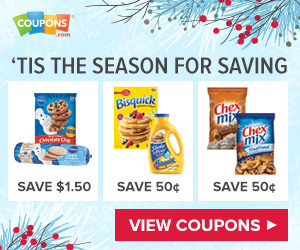 Enjoy right away or refrigerate and keep enjoying for the next 3-4 days!! 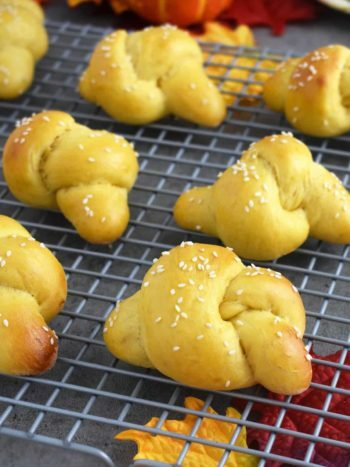 If you make this recipe, tag @olgainthekitchen on Instagram and hashtag it #olgainthekitchen or by clicking on social icons on top of this page. 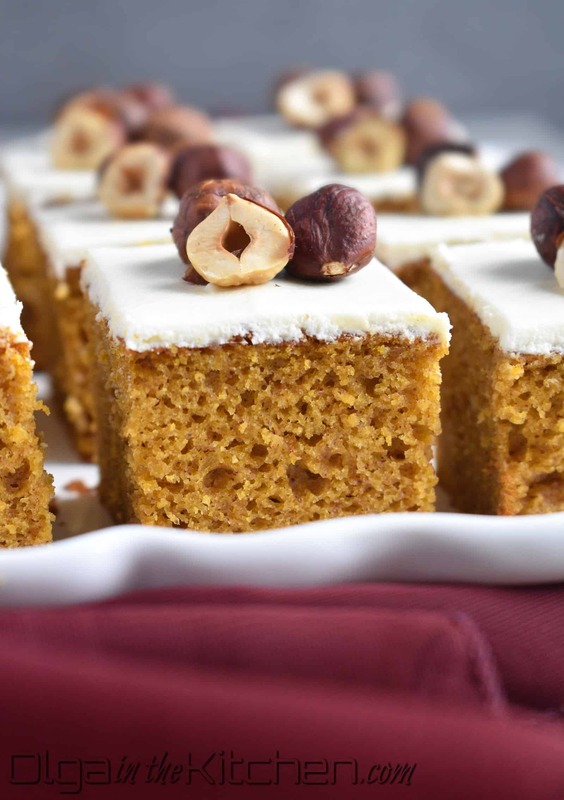 Pumpkin Sheet Cake: simple, fluffy, moist and topped with sweet cream cheese frosting. Preheat the oven to a 350°F. Grease and line a 9×13 baking pan with parchment paper and set aside.In a medium bowl, combine and whisk: 2 cups all-purpose flour, 2 tsps baking powder, 1 tsp baking soda, 1 tsp fine salt, 1 tsp cinnamon, 1/4 tsp nutmeg, 1/4 tsp cloves and 1/4 tsp ginger. Set aside. In a large bowl, combine 4 eggs and 1/2 cup granulated sugar. Whisk for 30 seconds. Then add: 3/4 cup brown sugar, 1/2 cup oil, 1 can pumpkin puree and 1 tsp vanilla extract. Give it a good whisk until combined. 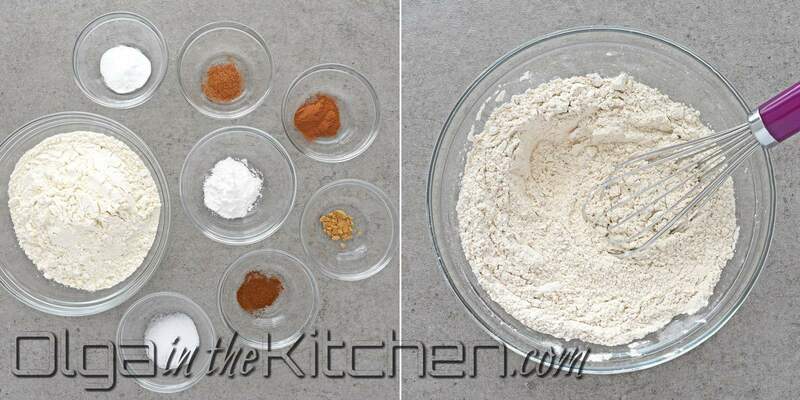 Add the dry ingredients to the batter and whisk until fully combined. Batter will be thick. Pour and spread the batter into the prepared pan. Bake for 27-30 mins until toothpick inserted in the center comes out clean. (I did 28 mins. Baking times may vary. If you find the top or edges of the cake is browning too quickly in the oven, loosely cover with aluminum foil). Remove the cake from the oven and let it cool for 10-15 mins then by grabbing the parchment paper on both sides, slowly transfer the cake to a cooling rack to completely cool. (Gently go over the sides with spatula where there is no parchments paper before picking the cake up to make sure it’s not sticking – sometimes happens). 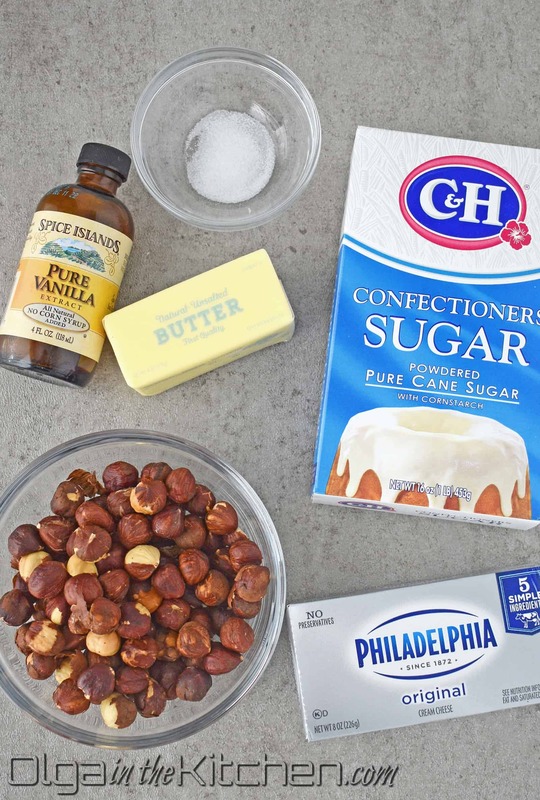 TO MAKE THE FROSTING: In a medium bowl, combine and beat 1 stick unsalted butter and 4 oz cream cheese on high speed until smooth and creamy. Add 1 cup powdered sugar, 1/2 tsp vanilla extract and 1/8 tsp salt. Beat for about 2 mins until fully combined – start on low so you don’t get covered in powdered sugar and increase the speed to high. Spread the frosting on the cooled cake and refrigerate for 1-2 hrs. This will help the frosting set and make the cutting easier. Cut off cake edges and cut the cake into squares. (When cutting the cake, wipe off the knife with a napkin every once in a while – this will prevent the frosting from getting onto sides and crumbs of the cake on top of frosting). Decorate with hazelnuts or pecans. I prefer hazelnuts here – gives that elegant look to the cake! Enjoy right away or refrigerate and keep enjoying for next 3-4 days!! Thanks Diane, I’m glad you liked it so much. You know my theory…if you know where the flour is located in your kitchen then you’re a baker!? This cake looks so soft and fluffy! Can’t wait to make this! Thanks Karly, it’s a favorite around my siblings because of how fluffy it is. You can’t stop eating 🙂 Let me know how it turns out! I made this cake for my work potluck and boy it was so delicious. All of my coworker ladies said they will never buy any pumpkin cake or cheesecake from stores from now on because it’s the best pumpkin cake they ever had. I sent them all to your blog and told them to leave comments once they bake it. Seriously THE BEST!! Thanks a bunch Olivia 🙂 I see few comments already, hope they liked it! Wow! It turned out so moist and good! I skipped the nuts because kids don’t like. My brother said it was the best pumpkin cake he’s ever had.Sharing the recipe with mom!Thank you Olga!